Like Roald Dahl and Catherine-Zeta Jones, the equals sign was born in Wales. It was 1557—not that long ago, in the scheme of things. Just a few years before the birth of Shakespeare. In fact, the Danish prince and the Scottish king captivated the public long before their humble Welsh neighbor reached wide renown. Over the centuries, this stilt-legged creature shortened into the compact and tidy symbol we know today. 10 is equal to 7 + 3. 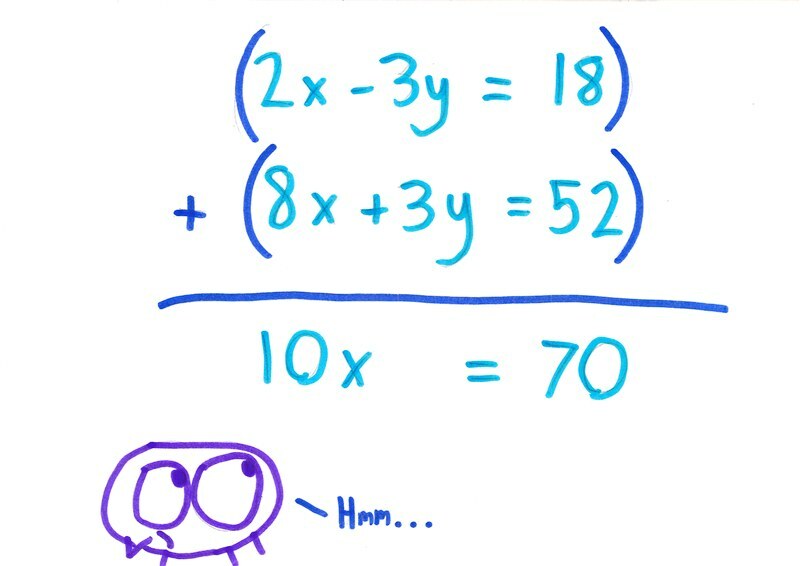 8 x 9 is equal to 72. And of course, a2 + b2 is equal to c2. The equals sign offered a way to avoid the tedious repetition of these words. Or, as Robert Recorde, the father of the symbol, put it: to auoide the tedioufe repetition of thefe woords. An equals sign, then, is a verb. 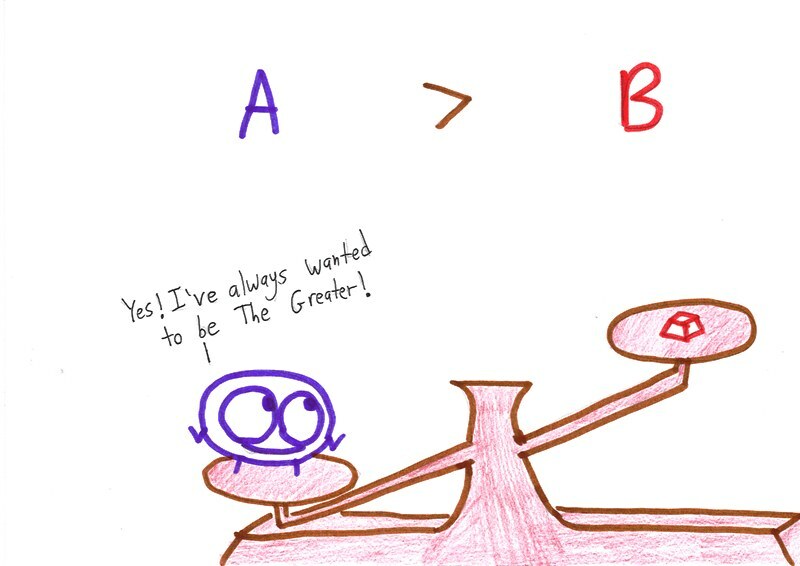 It’s the mathematical equivalent of “to be”—just as common, just as concise, and just as powerful. But that’s not what kids see, is it? Asked what goes in the blank, kids choose 9, because 4 + 5 = 9. Of course, only the last of those equal signs makes any sense. The other two are bald lies. 7 x 5 doesn’t equal 35 – 9, and 35 – 9 doesn’t equal 26 / 2. 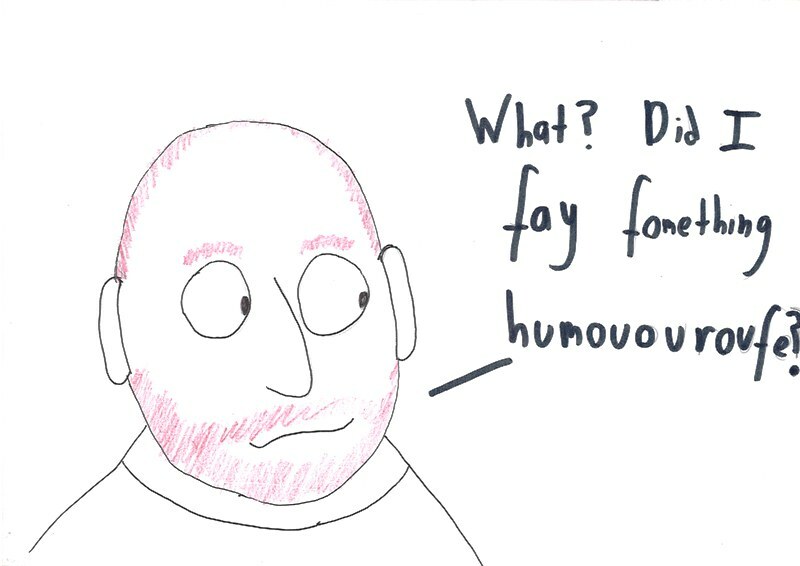 Poor old Robert Recorde would hang his head in sorrow. Luckily, there’s a simple visualization of equality that can brush aside many of these misconceptions in one forceful sweep. An equation is a statement of balance. See the two sides? I’ve got different weights on each but the total is the same. I can take away the same weight—say, 15 pounds—from each side, and they’ll still be equal. They’re not the same as they were before, but still the same as each other. Similarly, I could add 5 pounds to each side, and they’d still be equal. Or I could double each side. Or halve each side. So long as I do the same thing to each side, they’ll still be equal. The “<” symbol means the opposite. 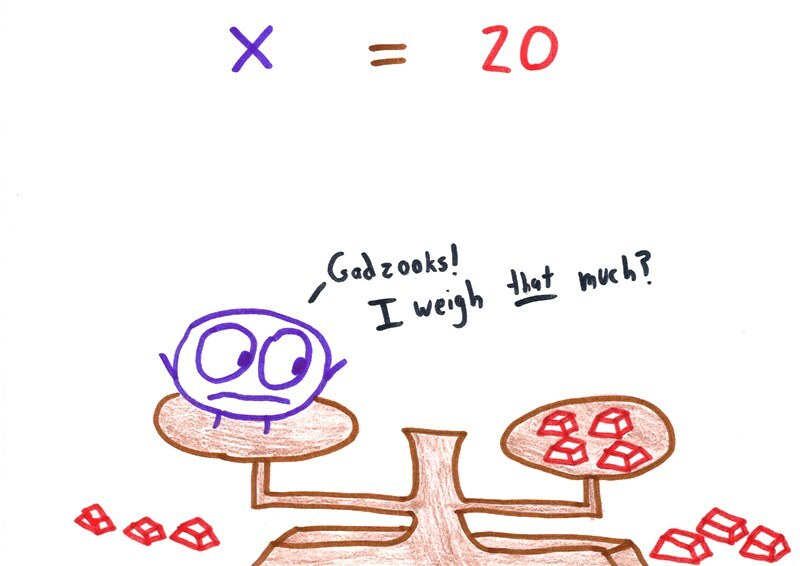 I’ve had students ask me whether we can switch the sides of an equation, as if they need to consult the Bylaws of Algebra in some dusty legal library before making such a move. But understood with balance statements, it’s obviously true. Weirdly, my school’s textbooks teach “solving for y in terms of x” as a fundamentally different problem than merely “solving for x.” But in this light, they’re virtually identical. Of course, you can’t really “add equations.” That’s nonsense. What you can do is add the same thing to both sides of one equation. I don’t mean to say that this visualization is a magic pill, a cure for all misconceptions and fevers. No single key can unlock every door in mathematics. For that, you need flexible thinking, creativity, a healthy faith in your own abilities and a healthy skepticism of your own results. 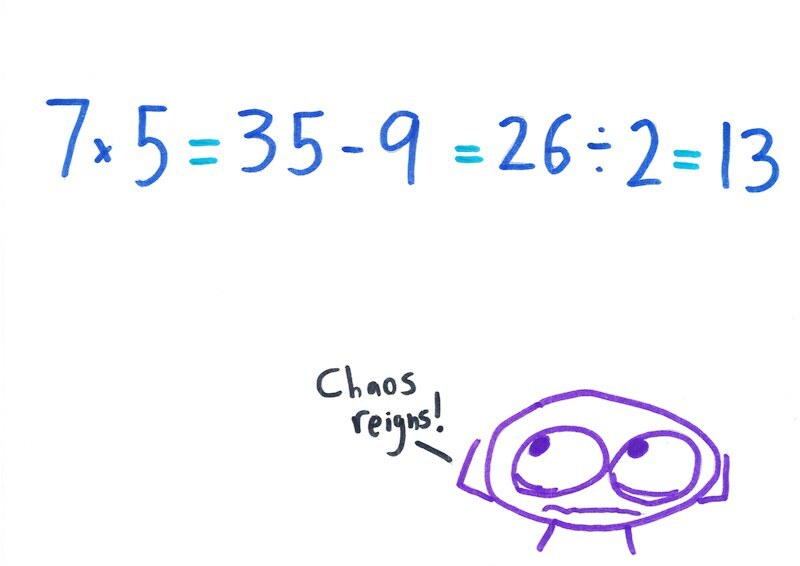 Still, thinking properly about the equals sign sure helps. I’ll confess: moving to the UK has heighted my affection for Wales. Sure, the English gave us a global language, the industrial revolution, and soccer. But the Welsh have gifted our planet a humble little symbol that compresses into two quick pen-strokes the far-reaching idea of equality itself. Nevin objects to my objection: “There are so many mathematical terms and symbols that are already overloaded to have multiple meanings, that [this use of the equals sign] really isn’t hurting anything.” The problem, to me is that students are not consciously adopting a different convention. Instead, they’re doing something unconventional, believing it’s conventional, and potentially missing an important concept in the process. And Bertrand Russell was Welsh. Apparently Wales is a secret mathematical superpower. About the “ungrammatical gibberish”…would you care if they used, for example, commas or semicolons to separate the the steps of their calculations? As in, “7×5; 35-9; 26÷2; 13”? What about a regular colon? Or a colon that’s stretched horizontally? 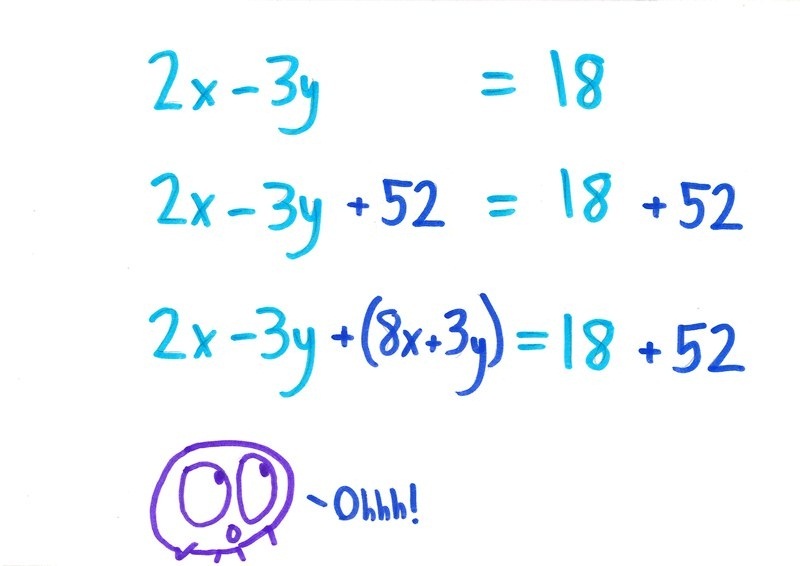 I think it is perfectly obvious what is meant by the sequence of markings in your example, and indeed it is far more efficient to write it that way than to redundantly mark down each intermediate result twice, as in, “7×5=35; 35-9=26; 26÷2=13”. There are so many mathematical terms and symbols that are already overloaded to have multiple meanings, that it really isn’t hurting anything when someone overrides a symbol that happens to be two parallel lines to serve as shorthand for, “equals the next term and then that term is also used as the first input for the subsequent operator”. Math notation is all about being concise, and if anything I’d say people who come up with their own notation when it is convenient are advancing the cause. Personally, I use an arrow (→ or ⇒) for the purpose in question, but I don’t see any compelling a priori reason to prefer overloading one operator rather than another. 1. First of all: Yes, I’d prefer arrows or semicolons. At their level of mathematics, those symbols have no fixed meaning to override. 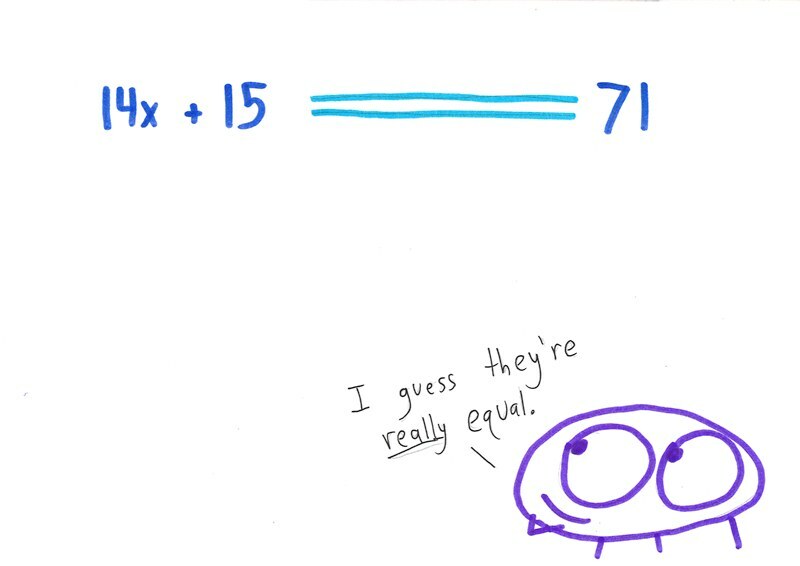 Makes more sense than overloading the equals sign. 2. Notation is about more than concision; it’s about clarity and precision, too. Notation is a way of capturing mathematical thought on paper. A misuse of notation sometimes (as in this case, I believe ) suggests a problematic way of thinking. 3. Yes, it’s clear what they mean, but for young students just learning how to communicate mathematically, that’s only half of the battle. They also need to learn the conventions of the language (just as English students must learn spelling and punctuation). It is all very well to overload a symbol if the original meaning is a good one, and the overloading makes the symbol more useful. 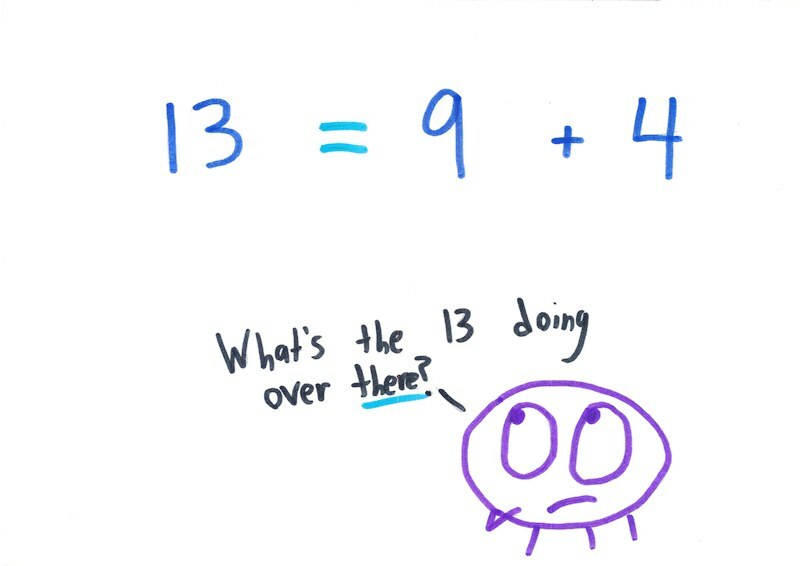 But we have a situation where the original meaning (at least as understood by the pupil) of the “=” is “gives” or “is”, as in 2+3, is 5 is not the best one. Perhaps if the teacher used these words in this situation things might not be quite so muddied. It seems to me that there is an insane desire to make stuff look like math and force the mathematical language down like the production of foie gras, and leave the real world behind. What adult says “I have to add these two numbers, 6 and 9. Let me calculate the sum. They say “What’s 6 and 9 ? 15? Yes ! “. As well, the real world meaning of 3 x 10 = 30 is “three tens is 30”. My dad just made this point to me in an email, too. I think you’re exactly right. I’m not sure about this one. 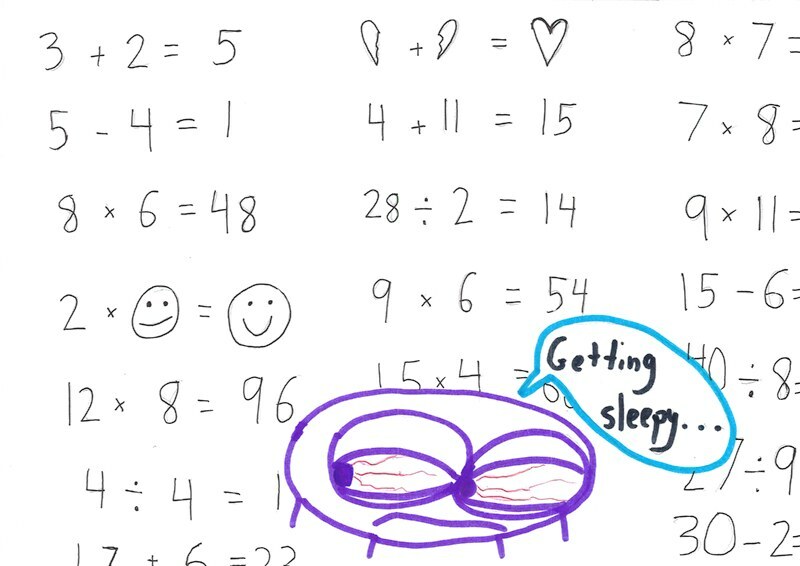 Young kids (6,7,8), who haven’t used the calculator that much, do this too. It’s because they get lots of sums in that calculator format. Nice post. Love the visual with the balance. 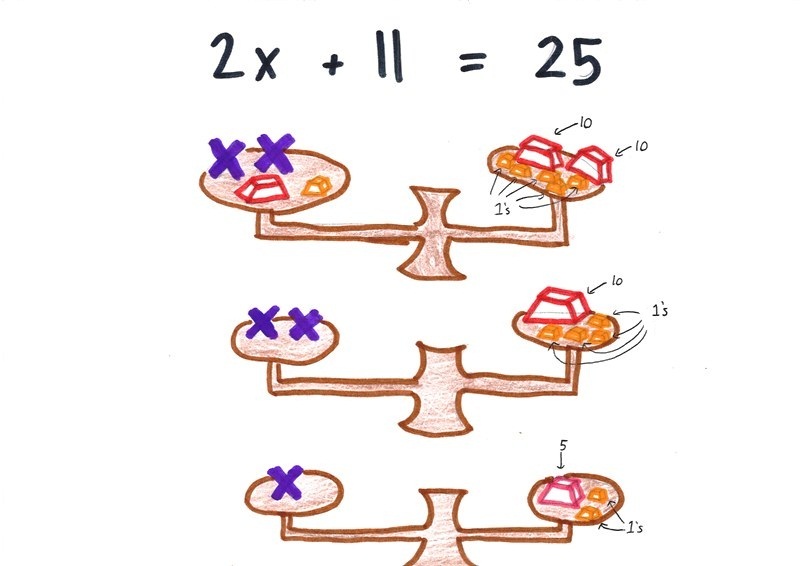 Regarding the systems of equations: perhaps this point could be communicated more powerfully by drawing *two* balances, one showing the equality of 2x-3y and 18, the other showing the equality of 8x+3y = 52. Then transfer the items from one balance onto the other! Yeah, I like that a lot! Thinking of it as a transfer of items rather than as a special case of “adding the same to both sides” is a more natural visualization. The position matters when the symbol = is overloaded with its imperative meaning, as in most programming languages. We are commanding the computer to make two things equal, and there are two ways to do that – changing the left, or the right side. By convention, we assume the left side. The “mathematician’s language” R actually supports assignment operators -> and is rarely used. Logic languages like Prolog will actually try all possible ways to make the two sides equal and output all solutions. .. supports assignment operators -> and is rarely used….. Supports left and right arrow. Silly website is trying to strip html elements and breaking my text. Grrrr. I’m sure you can Probably make this better, I Probably made an assumption or two I shouldn’t have. Just part of my homework problem! My point is that you can definitely have multiple ‘equals’ signs in an expression. 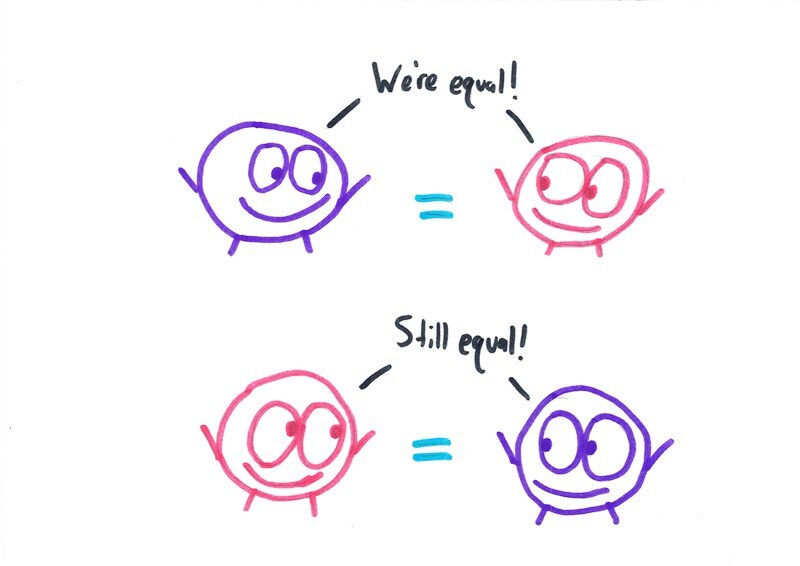 It is true that each equals sign is considered individually, i.e. I am stating that for the probability that y is equal to one, given x, parameterized by zero is equal to zero point seven, so I could just substitute y = 1 with something like ‘z’, and end up with P( z | x ; Θ ) = 0.7 for one, but z still represents y equaling one. 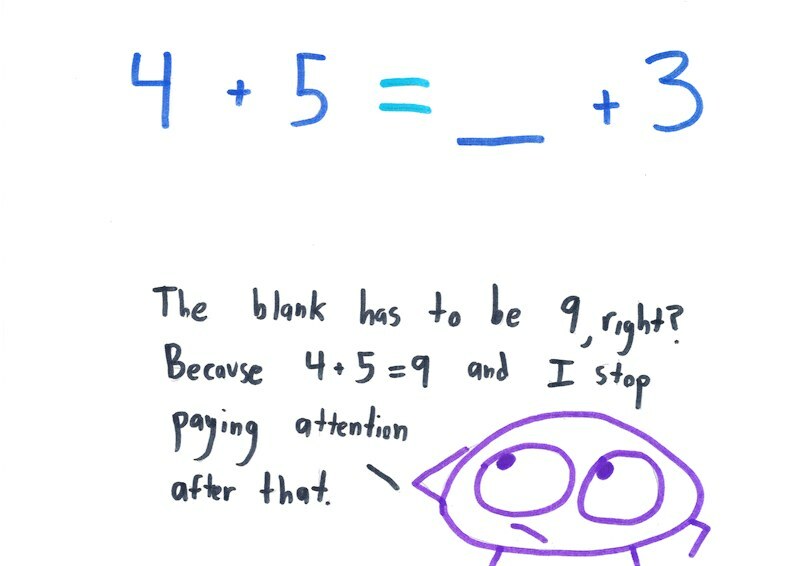 I sometimes wonder if we should have kids write “is equal to” until they hit algebra. I don’t think they really get it. 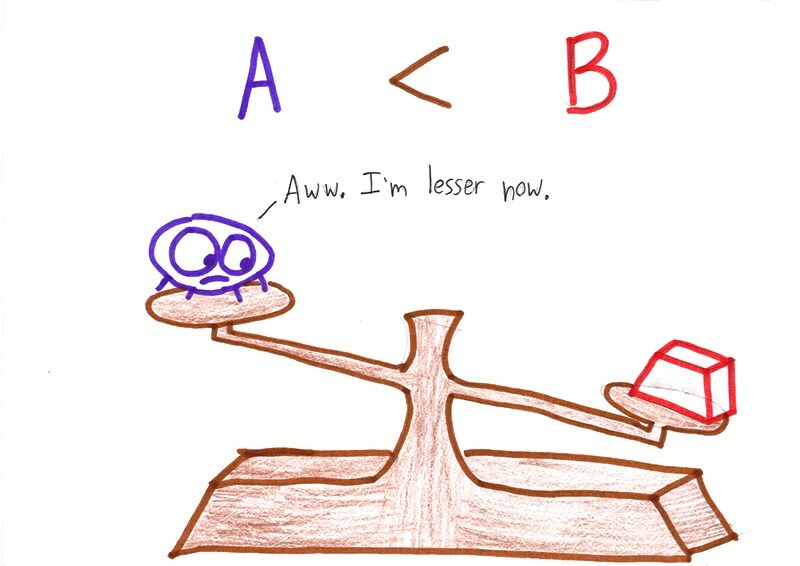 I’ve used the balance illustration many times, and a lot of kids still don’t seem to understand. I was reminded of that with my younger son this fall. 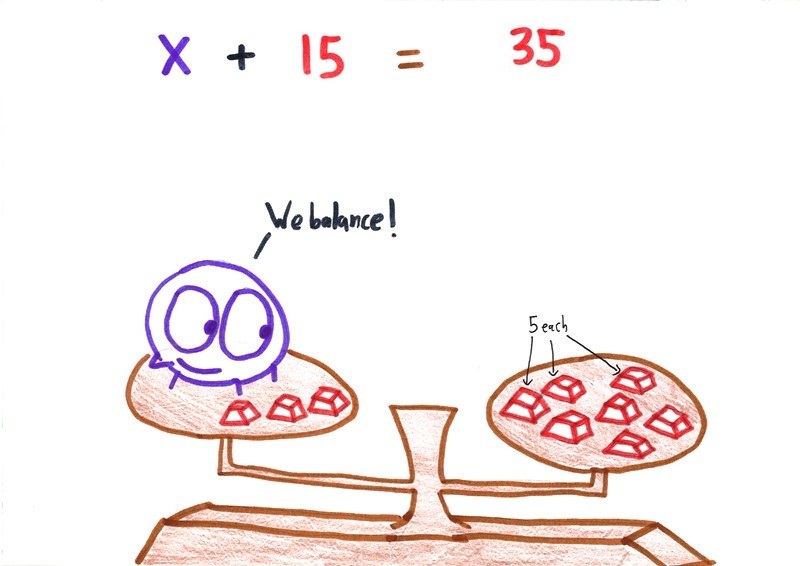 He’s in prealgebra and while he gets the whole “what you do to one side, you must do to the other,” it took a couple years of drilling that phrase even after seeing the balance analogy. I also think it would help them to better understand what is meant in word problems. If they wrote “is equal to” it wouldn’t necessarily mean they processed the language. I work a whole lot with students one-on-one and oh, boy, the strategies they use — usually successfully — to get the right answer are amazing, and often based on manipulating the symbols to resemble the example they’ve figured out is the best model. They crash *hard* as soon as comprehension is necessary. And I like “flexible thinking, creativity, a healthy faith in your own abilities and a healthy skepticism of your own results” lots too. and it seems to help!